I love growing succulents in terracotta pots - they have the perfect blend of weight to stop the heaviest of my plants from tipping over, and permeability so the roots can get oxygen and also excess moisture can escape. Almost all of my collection is now grown almost exclusively in these rusty orange beauties - finding them is the tough part. 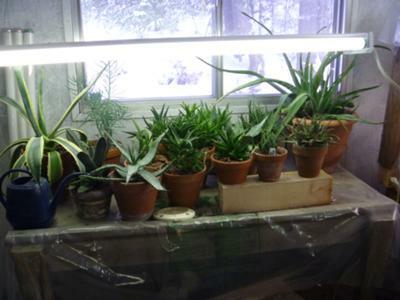 I scrounge them from other gardeners who have given up on them in disgust (they're no good for growing any other kinds of plants but succulents) so they sit discarded and dusty in a garage or barn until I find them, and give them a new home and an important purpose. 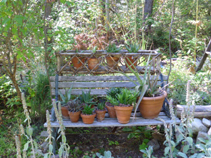 Also look for terracotta pots in garage sales, thrift stores and in the recycle center. Don't worry if they look dirty and covered in old fertilizer salts - a soak in some warm water with a dash of pickling vinegar will clean them up, and they'll be ready for planting with succulents in no time. See more about terracotta clay pots here. I've discovered the same thing Jacki, terra cotta is the way to go with succulents.They add stability to those plants that are "chunky monkeys" and in my opinion seem to provide a more desirable growing environment. It IS a challenge finding them though. Our local hardware store supplies them, but I refuse to pay the price... it's fine if you have one or two plants, but you could almost remortgage your house if you require any real number... or large ones. I was fortunate to find a dozen or so at a tiny local family owned Hardware store which is going out of business. I'll miss the excellent service and friendly atmosphere of the store but was happy to get the clay pots. Another positive aspect of clay pots, is that even the broken ones can be "pressed into service. The shards are great when smashed into smaller pieces and added to the bottom of planted pots for extra drainage. I use the larger broken pieces for plant labels in my display beds. I use an Industrial Sharpie felt pen which will last for one full year before it fades. I've been known to drop a cracked pot on purpose just to make more plant labels! Wow! That's an EXCELLENT idea!! I won't have to smash the big bits any longer, I'll give them jobs as "indentifiers". This website is a treasury of wonderfully helpful hints, thanks Jacki.